Who would think that a subway ride could turn out to be so interesting? That’s probably on everyone’s mind the first time they get a glimpse of the unique Stockholm subway art at one of the many stations throughout the public transit system of the Swedish capital (Stockholms tunnelbana). 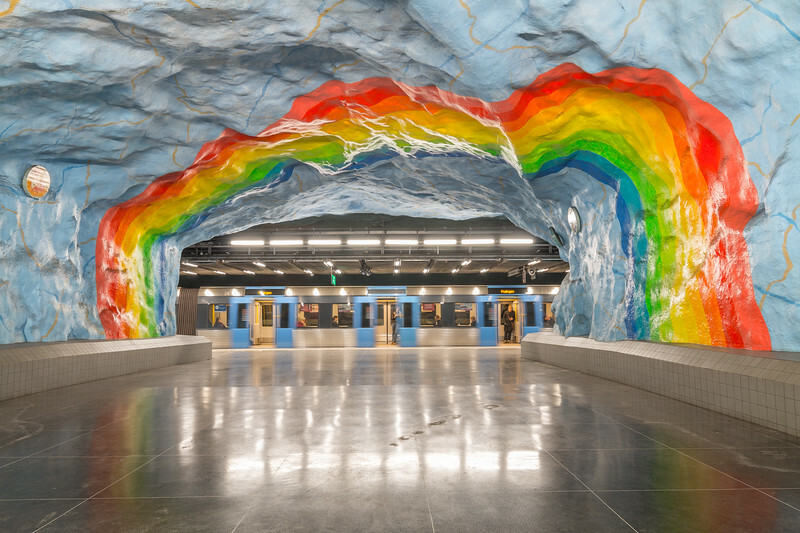 With over 100km and 90 stations (out of 100) decorated with some sort or form of art, the Stockholm subway is often dubbed as the world’s longest art gallery. This is the result of a project that started back in the 1950’s as an idea to make art more accessible and, so far, has had contributions from over 150 artists. 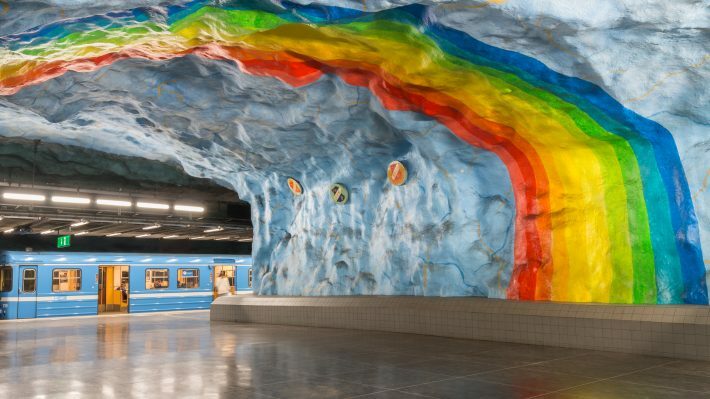 Sculptures, mosaics, paintings, you name it, the Stockholm subway art has a bit of everything. 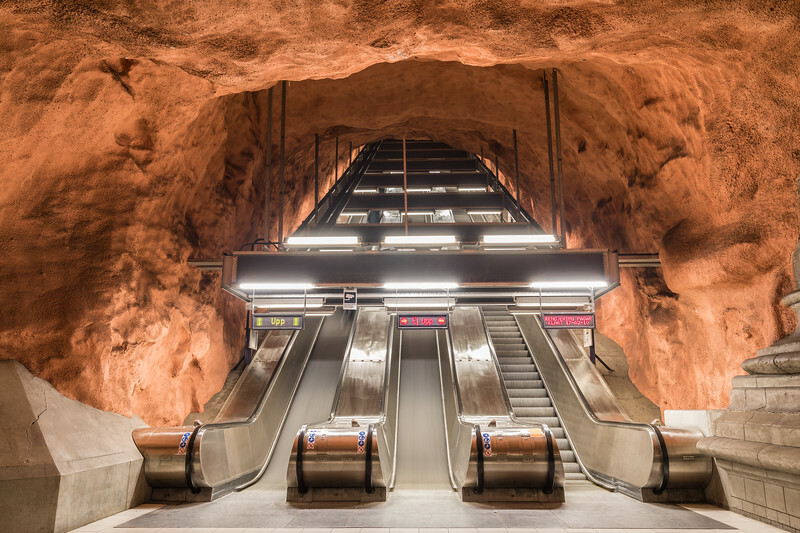 The Stockholm subway has some impressive stations and, on our most recent visit to the city, we managed to, finally, visit a few of them. Throughout this article, we highlight the most popular ones and where to find them. Rådhuset station is located in Kungsholmen, an island next to central Stockholm, and sits below the Court House, hence the name in Swedish. The raw look of the station with exposed painted bedrock is its biggest characteristic and it feels like an authentic cave. A design that is used in other stations as well. 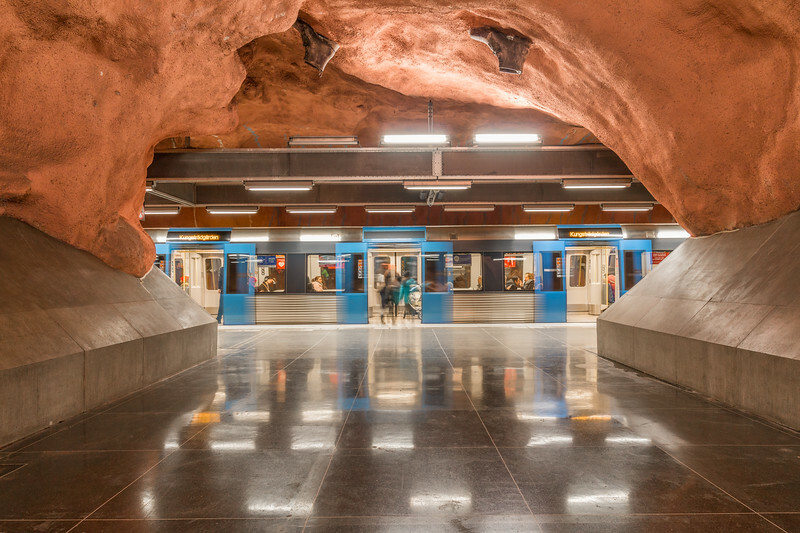 This station’s art was created by Sigvard Olsson in 1975 with the goal of connecting with the history of the area which was occupied by Franciscan monks in the 15th century. The colorful Stadion station is a tribute to the 1912 Olympic games that took place in Stockholm and lies next to the Olympic Stadium. 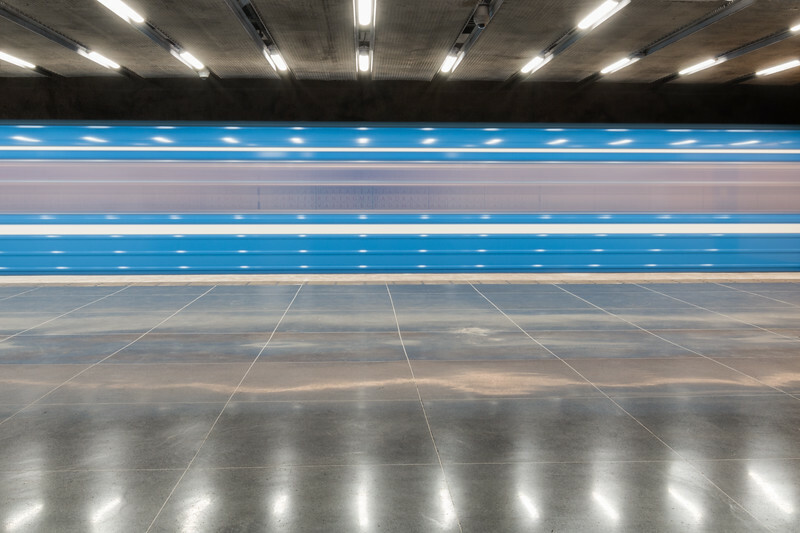 The Olympic colors can be seen throughout the station, a creation by Enno Hallek and Åke Pallarp in 1973. Unquestionably one of the most popular and eye-catching stations. A must-visit! 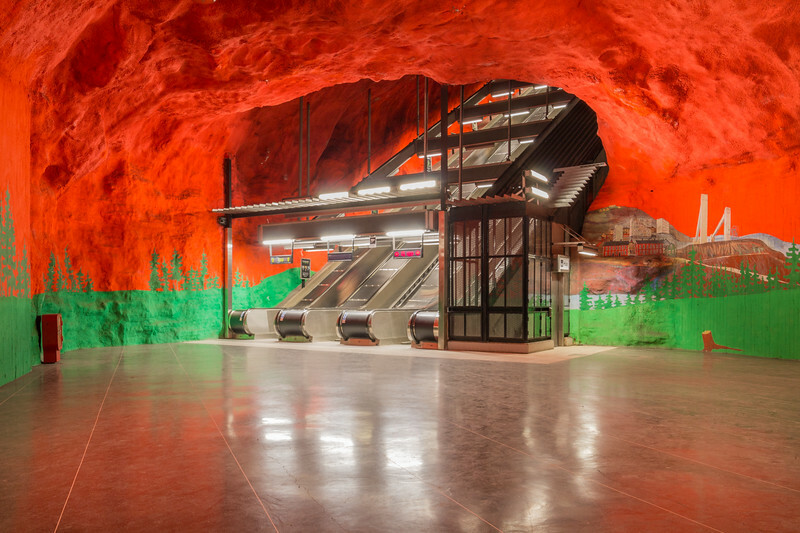 Solna Centrum is also a cave-like station yet a more vibrant one. The predominant intense red color stands out immediately as the dramatic sky of a 1 km long forest painted on the rock. These scenes depict topics that were important in Sweden when the station was created in the 70’s – and still are today, such as rural depopulation, the destruction of the environment, forests, and nature. It was created by Karl-Olov Björk and Anders Åberg. 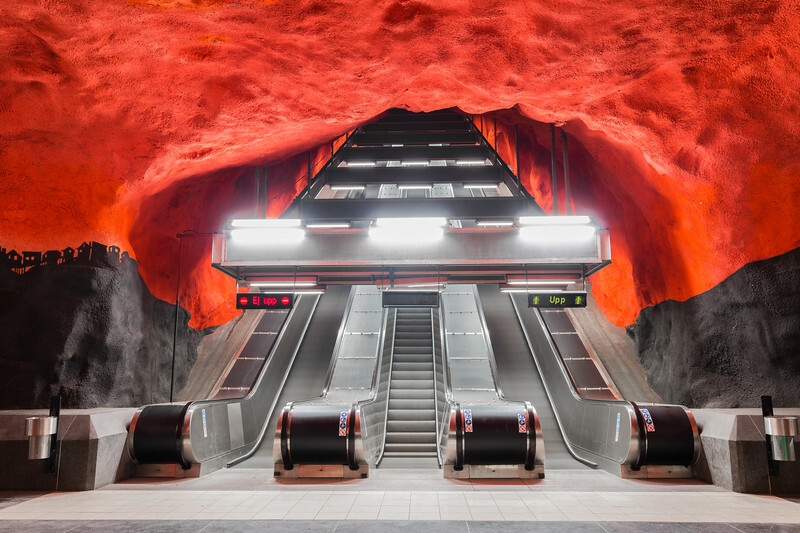 This station has to be one of the most beautiful on the Stockholm subway art tour. 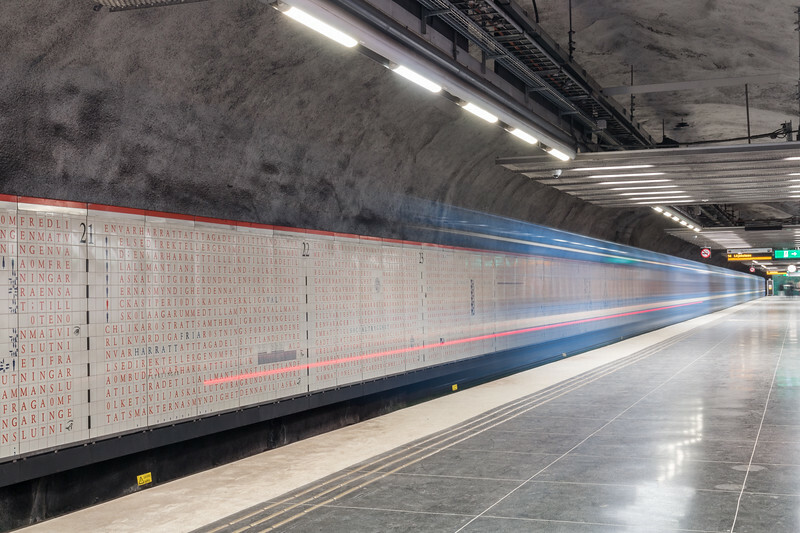 The Universitetet station serves the Stockholm University and is known for its tiled murals that comprise both the Universal Declaration of Human Rights and the travels of Carl von Linné, a Swedish botanist. This station is one of the few which had contributions from foreign artists, in this case, Françoise Schein. Tekniska Högskolan station gets its name from the nearby Royal Institute of Technology and the art created in 1973 by Lennart Mörk is a link between the two. It represents the four elements (wind, water, fire, and earth) as well as the universe and technological advances. 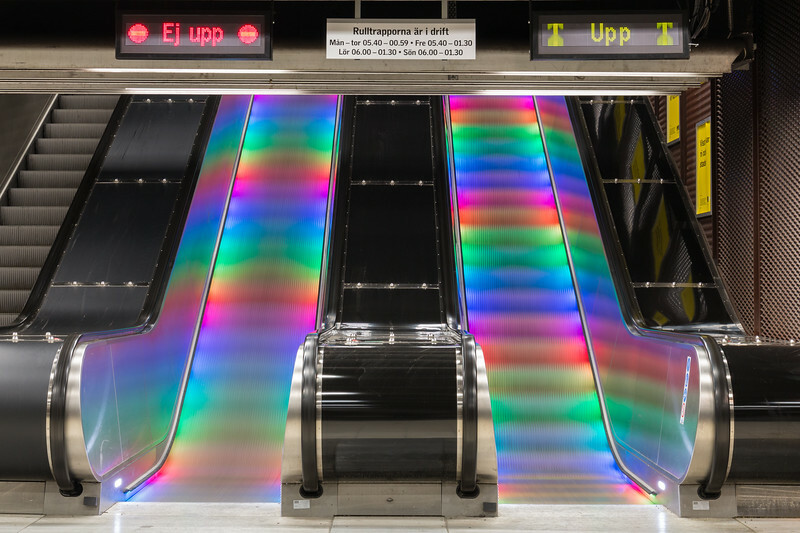 What caught our attention at this station was something more modern: the rainbow escalators. Quite unique. T Centralen is Stockholm’s central station and all the subway lines stop there, making it a very popular and busy place. 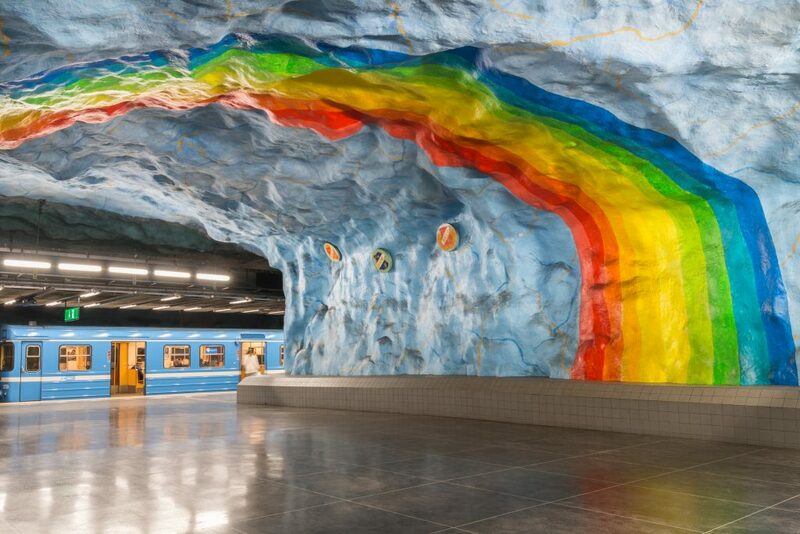 This is where the Stockholm subway art really began. 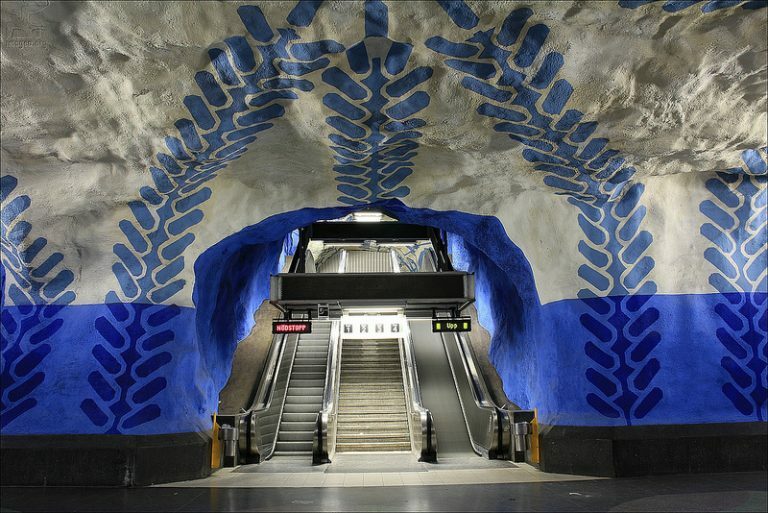 The most iconic and important part of the station is on the blue line which is known for Per-Olov Ultvedt’s white and blue vines, flowers and silhouettes. Kungsträdgården station is known as the underground garden, created by Ulrik Samuelson in 1977. This station at the end of the blue line consists of a green colored mix of differents pieces of art that aim to tell the story of Kungsträdgården and surrounding area. Definitely the oddest station as far as art displays go. 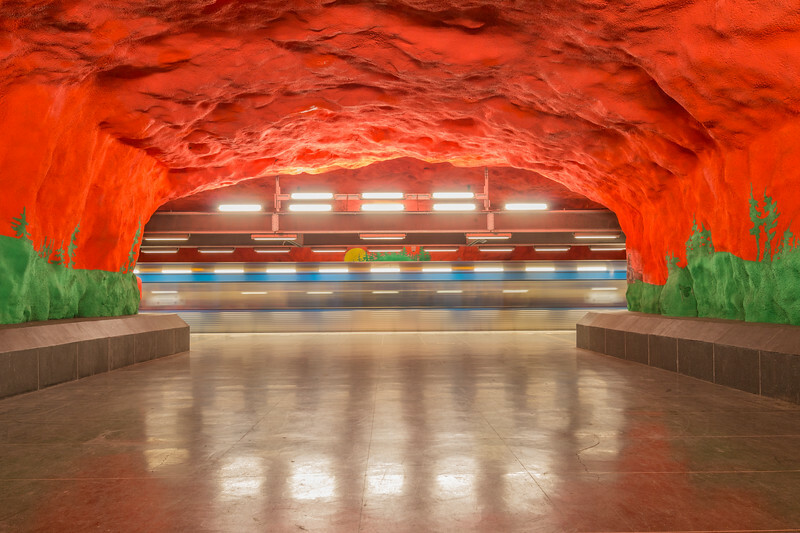 The Stockholm subway consists of 3 lines – red, green, and blue. In reality, this translates to 7 routes because of different terminal stations. Don’t worry, it’s easy to navigate and there’s plenty of information about it. A ticket is required to access the stations. You can get a card and add funds to it or buy a travel card (eg: 24h). For more information, visit the official website. If you’re planning on photographing the stations, that’s perfectly fine and you can even bring your tripod and your camera gear like we did. The only thing to bear in mind is to be respectful to the people using the stations and pick the non-rush hours. Planning a trip to Stockholm? Don’t forget to visit the Stockholm subway art! 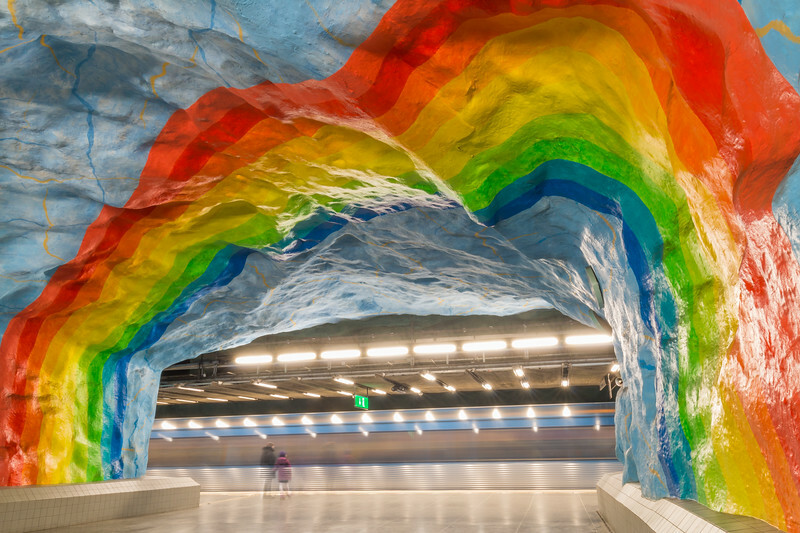 This subway ride would certainly cheer up any morning commute! 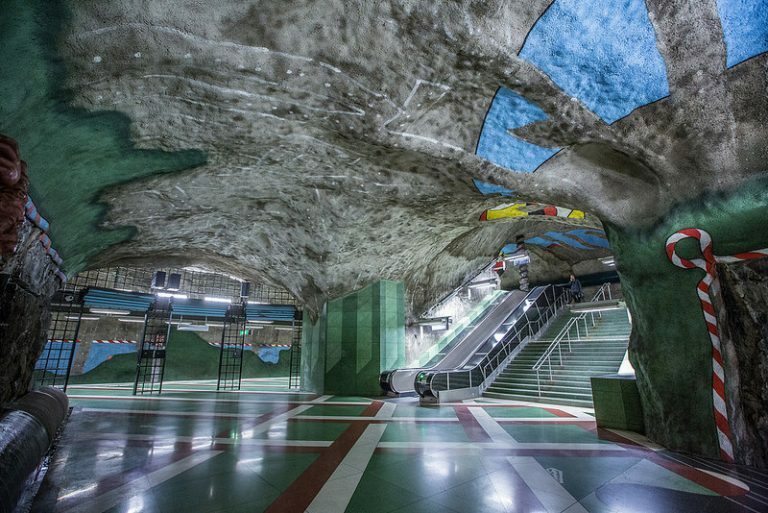 Ive always wanted to explore the metro system of Russia – but now Sweden will have to go on my bucket list too! We also want to visit Russia asap! Brilliant pieces of art … we have started to do the same on a small scale in Canada, but nothing like this! Excellent piece of post which describe how artist are redefining and showcases their artistic work of the past culture of their country in a modern and intellectual way in the front of many peoples of their own country.